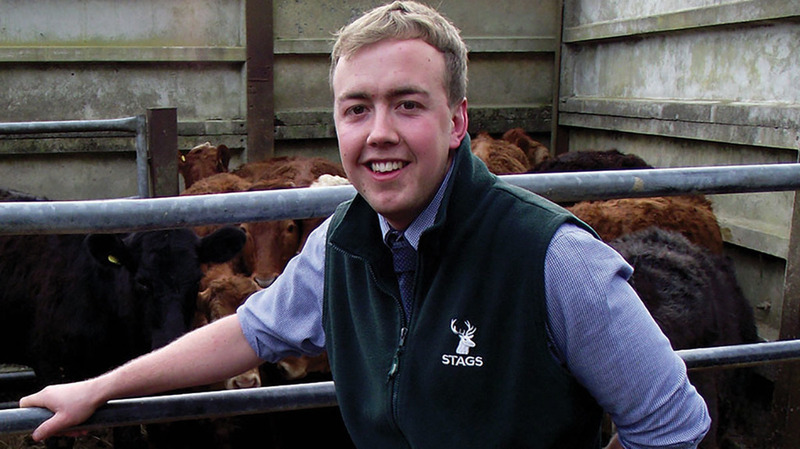 Harvey Pile, 22, is a trainee auctioneer at Stags Auctioneers, running at South Molton Market, Tavistock Livestock Centre and Honiton Collection Centre. He currently auctioneers poultry and dispersal sales. Markets: As a farmer’s son I could always be found accompanying my father to the local livestock markets in Taunton and Highbridge. Since then these markets have ceased to exist but I am now a young man entering the industry striving to progress and succeed. In doing so I find myself turning my hand to an array of jobs and tasks during a working week. The job of an auctioneer can appear to be just that, auctioneering, but at Stags Auctioneers we believe you must be adaptable and able to carry out an array of tasks; from grading, sorting and scanning sheep in one of our markets, to helping with the washing and cleansing of the market at the end of a busy sale day and carrying out one of the numerous administration jobs associated with running a market. And of course, everything in between. Day-to-day: A typical week, with lots of early starts, begins with a busy Monday morning in east Devon where I assist with the running of Honiton Collection Centre, a unique red slaughter stock market where the six-day standstill does not apply. Here, we as auctioneers act as agents dealing with multiple abattoirs throughout the country. We offer farmers a live fixed price while placing animals on a deadweight basis into abattoirs which provides a fast, efficient and secure way of marketing their slaughter stock. Tuesdays often mean a trip to Tavistock Livestock Centre; a journey to west Devon where store and breeding cattle and sheep are sold on a monthly basis with more seasonal sales included in the calendar throughout spring and autumn. Wednesdays are a day spent on what feels like endless paperwork and administration jobs. Every Thursday morning, I travel to north Devon and assist with the running of South Molton Market, a large prime sheep market specialising in the sale of prime lambs, cull ewes and rams with seasonal store lamb and couple sales. And on Fridays we round up the week, preparing vendor statements and collaborating market reports. When this is done, we have the chance to get out and meet clients. Working up: Among this already busy week, Stags historically specialise in on-site dispersal sales which can consist of livestock, machinery, horticultural, and building equipment dispersals. They are usually held on a Saturday or Wednesday, attracting huge crowds and offering us auctioneers a day away from our usual environments of livestock markets and the market office. I hope to progress to a stage where I am not only a competent auctioneer, but also a helpful and knowledgeable point of contact for our clients throughout our three markets. I believe working up from the bottom is the best way of earning respect from your colleagues and clients and gives you an indepth and full understanding of how an auction mart business functions.